Those of you who follow my blog (thank you!) or know me in real life, will already be aware that I’m on a bit of a fitness journey. It started almost exactly one year ago to this day and you can read more about it here. I’ve lost four and half stone so far, so I’m looking a lot slimmer these days and although I’d been losing weight since March 2015, no one really noticed for about 8 months (apart from close friends/family who knew I’d been trying really hard), so I was very comfortable just getting on with things. 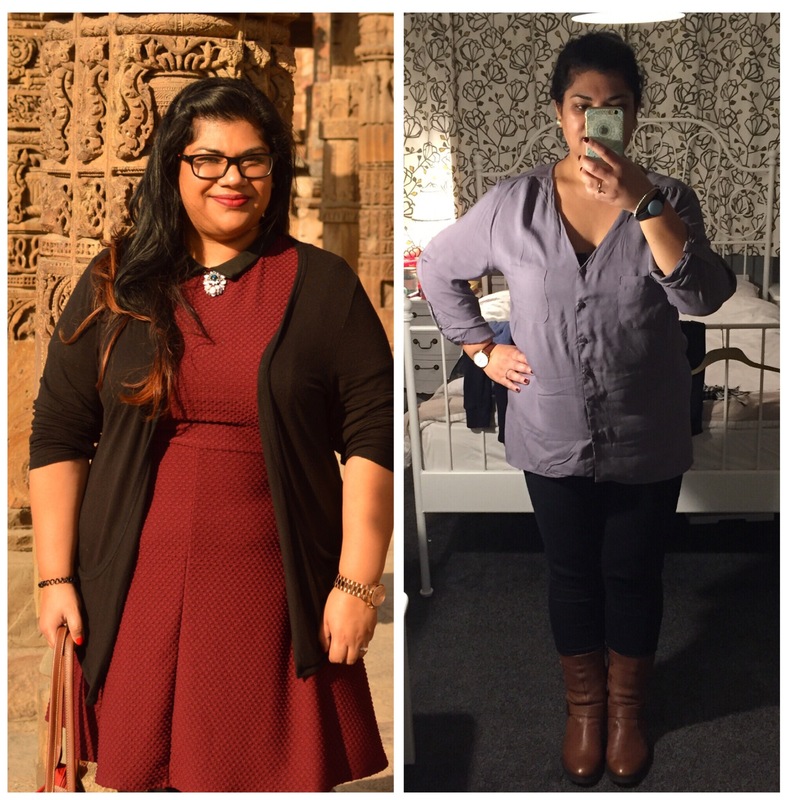 It was around November last year that I realised I needed to buy some new clothes that actually fit me – two dress sizes down to my delight! Once I started wearing the right size clothes, that’s when people started to notice. Makes sense really. People asked what diet I’d been following or gave me compliments on how I looked. One person asked if I’d had a ‘procedure’ – I think they meant a gastric band. It was pretty obvious quite early on that I had no idea how to deal with these comments/compliments. I’m proud of how hard I’ve worked and what I’ve achieved, so when people would say “you’ve lost a lot of weight” – I would often reply with “I know!” (which is okay, because let’s be real, that’s not a compliment, it’s a fact). If the comment was more along the lines of “you look great/amazing”, I found it a lot harder to respond to. I’d often try to divert attention away from me or change the topic of conversation, but not before getting clammy hands, feeling slightly anxious and saying a pathetic thank you which ended up sounding a bit patronising somehow. I’m serious, I’m bad at this. Why can’t I just be gracious about it instead of a bumbling fool? I’m honestly not blowing my own trumpet here, I get these comments a lot now and I am still struggling to simply say ‘thank you’. I don’t mind the questions, I can answer those… in fact, I like them. It’s just the compliments (I like them too, I just feel uncomfortable). Over the past few weeks I’ve been told a few times to “just take the compliment” after I’ve spurted out something nonsensical or said there’s still a long way to go. I like the new you. . . I’m not new, I’m the same, just lighter than I was before… but to be fair, I am clearly happier so in a way, they were right. You’ve lost so much weight, you’re half the size. I have lost a lot of weight, but you’re factually incorrect. Aren’t you losing too much weight? No, I’m losing about 1 lb per week and that’s after fasting twice and going to the gym 3-5 times. I still have more weight to lose. You always had a pretty face. Erm, thanks? Can you eat that/should you be eating that, on your diet? Yikes, are you the food police? Sometimes it’s just the tone or utter shock that I’ve managed to lose weight that I find uncomfortable too. I really don’t really know why I’m telling the whole world but maybe someone can relate to this post or help me out! Here’s the latest “before and during” picture I posted on Instagram. There are 15 months between these two photos. I still own that dress on the left and wear it to work now and again, only now I don’t wear the black cardigan with it. I’m going to have to give it up soon. It’s definitely too big, I just love the collar and the colour! If you have any tips or advice on how to accept a compliment graciously, I’d be very grateful. If you’re one of the lovely people who has had to endure my bumbling ‘thank you’ after you’ve said something nice to me, sorry… I’m trying! You are looking amazing!! Just smile and lap up those compliments, you deserve them! You look gorgeous in both photos but congratulations on your progress! It’s nice to go out, get new clothes and have people notice. I think a lot of people are the same about receiving compliments, we tend to brush them off and drag ourselves down in the process! Someone commented on how shiny my hair was a few weeks back and I said ‘thanks, I often think it looks greasy but it’s just shiny’, the girl probably thought why did I bother even complimenting her. I felt a bit guilty once I had said it! Although I like what people are wearing or what they’ve did with their hair, I often don’t say it out loud as I don’t have the confidence too, it’s something I’m working on though!